Lots of jazz artists and presenters like to talk about reaching a younger audience. But few go as far as clarinetist and saxophonist Oran Etkin, who regularly teaches and plays music to infants. Etkin created his Timbalooloo teaching method in order to reach potential music students before life, language, and thinking get in the way. In Timbalooloo, instruments are turned into characters—like the Kenyan drum Ngoma, Clara Net, and her mother Big Momma Tuba—all of whom talk, with a lot of call and response. Etkin wants children to understand that they can make an instrument speak, and use it to express emotions and ideas. He’s working hard to put the play back in playing music. 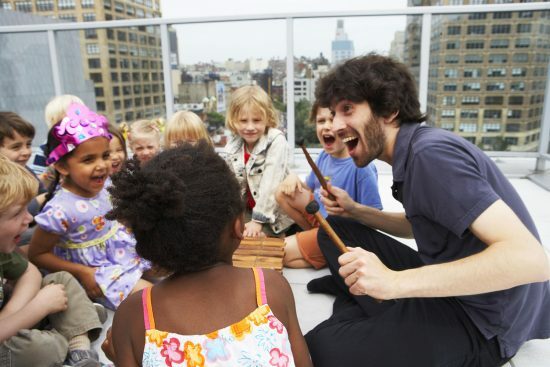 After sending teaching artists into schools, community centers, and even homes for several years, Etkin recently took the plunge and now has a physical space in Soho where Timbalooloo classes are taught by himself and a staff, many of whom have been with the program since 2010. Ultimately, his goal isn’t to produce an army of musicians. “The idea is that they really understand the language of music. They speak it, they have fun with it, they understand that they can play with it and that it’s something that belongs with them. And when somebody else is expressing themselves, they can get excited about the nuances of that expression rather than just sitting back and saying, ‘Oh, that sounds nice.’” Maybe someday he could expand the program further—to include jazz critics. You can learn more about Timbalooloo at timbalooloo.com.